Zonta Club of Pittsburgh is a member of Zonta District 4. 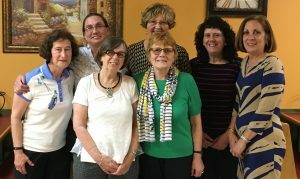 Currently we meet on alternating Tuesdays, Wednesdays and Thursdays during the second week of each month at The Rivers Club, located at Oxford Centre in downtown Pittsburgh. Board Meetings are conducted at 5:00, with General Meetings following at 6:00. Interested in attending a meeting? Contact Carolyn at ZontaClubofPittsburgh@gmail.com. Board Members at an informal meeting in April, 2016.